Whether blended seamlessly into a rustic setting or implemented into a formal space for texture and contrast, solid wood end tables and stools can be a fun and versatile addition to your home. Placed next to a lounge chair, lined up along the wall as extra seating for guests, or used in a bedroom as a nightstand, natural wood pieces are casually chic. 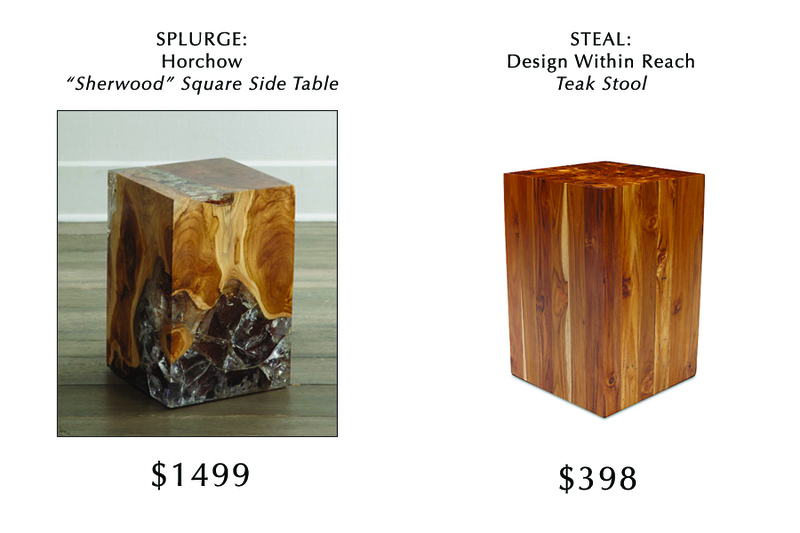 Although these tables are often comprised of a simple tree trunk, the two examples shown here exemplify the more polished side of the “solid wood log” category. The symmetry and smoothness of the square shape serves as a nice contrast to the “natural” look of the wood. You may think that $398 for a stool is hardly a steal, but a neutral, compact piece such as this one from DWR will last a lifetime. The Teak Stool, designed by Rama Watana for Design Within Reach, was created with the intention of utilizing sustainable teak remnants that are too weak to be used in other applications. You can enjoy the beauty of natural wood in your home without compromising your eco-concious ideals! For a true statement piece, however, I absolutely love the “Sherwood” square side table from Horchow. It shares many of the same versatile and eco-friendly characteristics, but with a bit of unexpected shine. Artisans handcraft each unique table, blending acrylic into the teak for a look that is both whimsical and modern. The combination of materials creates a sturdy, durable table that can support up to 200 pounds. Are you sold on the appeal of these wood tables and stools? Here is one more option to tempt you. Slightly cheaper than the DWR version, the Zuvan Side Table from Anthropologie (shown below) is truly budget friendly at $198. The low price and metallic finish make it a perfect option for anyone who seeking a playful hint of glam. 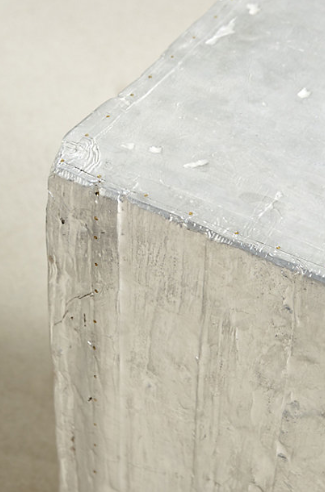 Available in silver or gold, the Zuvan table is made of recycled wood. To purchase the “Sherwood” Square Side Table visit Horchow. To purchase the Teak Stool visit DWR. 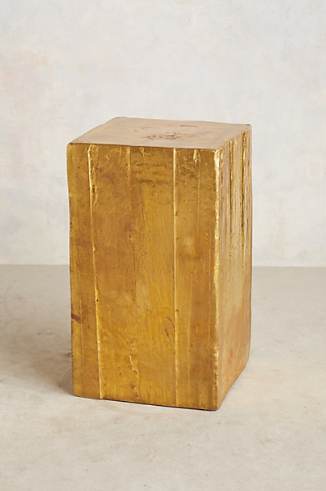 To purchase the Zuvan Side Table visit Anthropologie. Decorative knobs are a fun and easy way to spruce up your existing cabinetry and furniture. Although it may seem like a small detail, switching out standard knobs for a more unique style can take standard furnishings from merely functional to pretty and polished. I particularly like the look of colored glass knobs, which add a fun punch of color to a cabinet or dresser. Rejuvenation describes their pressed-glass and nickel knobs as reproductions based on styles popular in the late 19th and early 20th century, and prized by collectors today. The knobs are available in 13 different Depression-era colors. While $5.00 might not seem like much of a splurge, the cost of knobs can add up quickly. The typical dresser drawer has two knobs, and one dresser may have as many as 8 or 10 drawers. 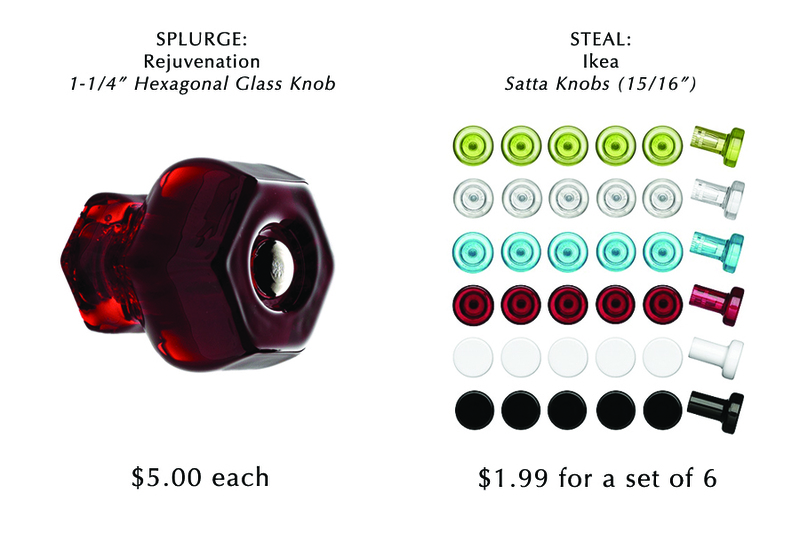 Ikea’s Satta knobs offer the same easy-to-install pop of color at a fraction of the price. Ikea’s knobs are plastic rather than glass, and they have a simple, streamlined silhouette as opposed to the historic detailing of the Rejuvenation knobs. But at a mere 33 cents per knob (they are sold in packs of 6), they are perfect for kids rooms, playrooms, or wherever you need an inexpensive update. Personally, I would splurge on the Rejuvenation knobs for “adult” spaces like the kitchen, bathroom, or master bedroom, but I’d opt for the cheaper Ikea knobs anywhere else. To see the full range of colors for the Hexagonal Glass Knobs visit Rejuvenation. To learn more about the Satta Knob visit Ikea. The vibrant Swirl rug designed by British fashion designer Paul Smith for The Rug Company is a real stunner, but at $134 per square foot it is a major investment that most of us cannot afford. Although it lacks the graceful curves of Paul Smith’s original pattern, the Tectonic Floor Rug from Land of Nod is an absolute steal at just $299 for THE ENTIRE RUG! If you are wondering, that comes out to $12.46 per square foot for the 4’x6′ size, and less than $10 per square foot for the larger 5’x8′ size. Both rugs are 100% wool. The Nod version is a blend of Indian and New Zealand wool with 100% cotton backing, whereas the Rug Company version is hand-crafted of 100% Tibetan wool by master weavers in the vicinity of Kathmandu. And while the Swirl rug surely has superior fiber and craftsmanship befitting it’s price, The Land of Nod does provide an 18-year quality guarantee on all of it’s products, as well as offers complimentary swatches if you contact their customer service department. One important difference between the two rugs is the range of sizes. The Tectonic Rug is only available in 4’x6′ and 5’x8′, whereas the Swirl rug is available in 10 sizes ranging from 3’x5′ all the way up to 12’x18′. If the lovely Swirl rug is within your budget, then by all means, invest in this gem of tactile artwork. But if you want to add a pop of color and energy to your home without going broke or living in constant fear of muddy shoes and grape juice, go for the playful Tectonic Floor Rug from The Land of Nod. 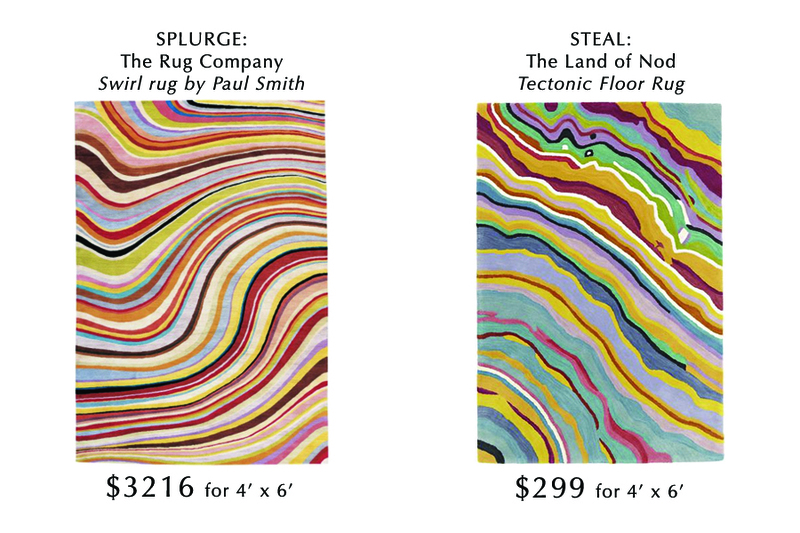 To learn more about the Swirl rug by Paul Smith visit The Rug Company. To learn more about the Tectonic Floor Rug visit The Land of Nod. The bright, snappy Spot Table by Tom Dixon has been stuck in my head ever since I first discovered it several years ago while sourcing furniture for a client’s living room. Despite having little desire to use red in my own home decor, I find the bold, shiny pop of color on the otherwise clean and simple table irresistible. 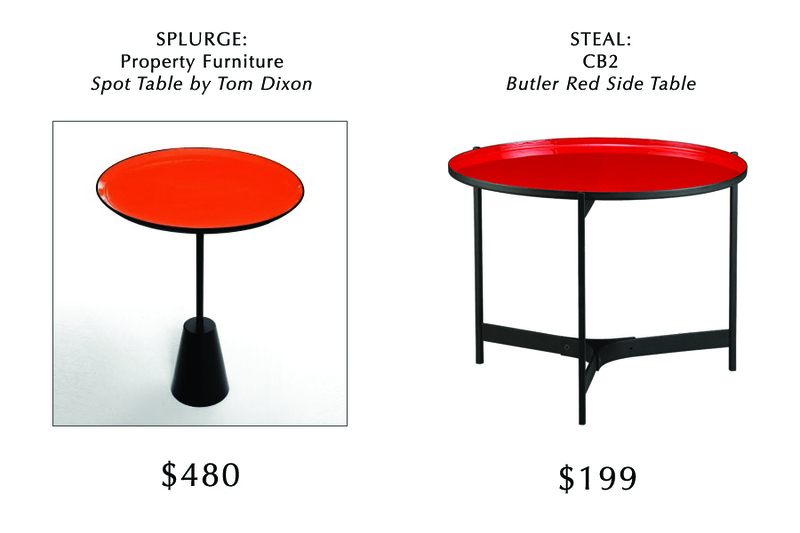 It is no surprise, then, that the new Butler Red Side Table caught my eye as I was flipping through a recent CB2 catalog. 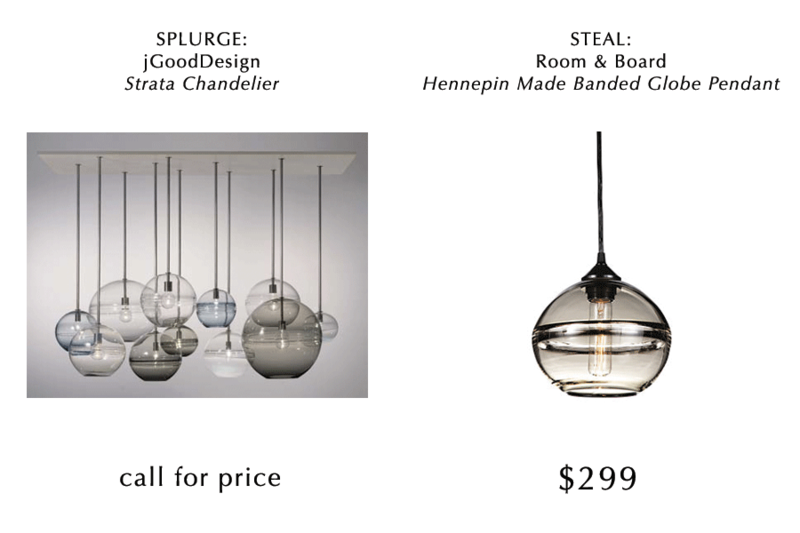 It instantly reminded me of the original Tom Dixon table, but with some distinct variations. Both tables are constructed of iron with an enamel finish on the top. The Tom Dixon table is available in red and white enamel (both with the black base), two heights (21″ and 26″), and a round or square top. Wider and shorter than the original, the CB2 table is not as streamlined but does offer the convenient feature of being able to remove the top for use as a serving tray. Either table is sure to add a splash of color to your room. With a pop of color and versatile functionality, these open storage carts are great for the kitchen, office, or even as an end table or bar cart in your casual living space. At $290, the weathered looking Lab Cart from Iron Accents has rustic chic appeal best suited to a farmhouse or industrial setting. 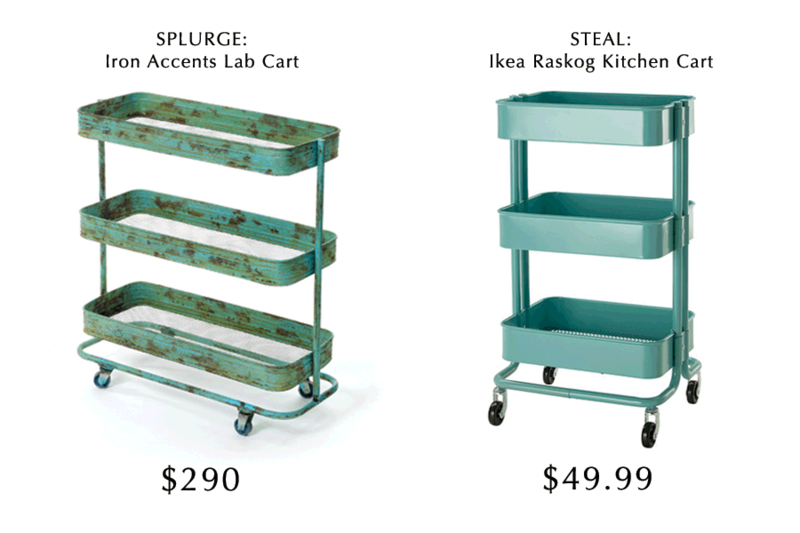 At $49.99, the Raskog Kitchen Cart (available in turquoise or dark gray) from Ikea is a bargain suitable for any number of applications. Line several carts up along one wall of your office for easy-access filing, pile one with books and stuffed animals in your kid’s room, or fill it with towels and toilet paper in the guest bathroom.